The term ”grisaille” describes a completely monochromatic painting in which all colors have been removed and the values are all rendered in countless shades of black, white, and (especially) gray. The grisaille technique was sometimes used for underpainting by the old masters who would then add color later. It was also used to portray sculptures, to cover large walls (in the fashion of trompe–l‘œil illusion), or, most interestingly, as the opposite side of triptych screens and altarpieces. If a hinged triptych was closed, the two grisaille panels would become all that was visible. 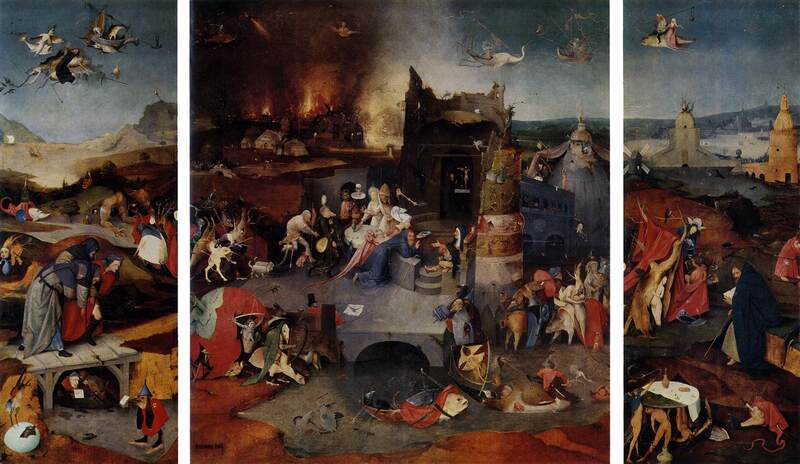 These two paintings are the reverse of what may be Hieronymus Bosch’s most bizarre work, The Temptation of Saint Anthony which was finished in 1502, and can now be found at the Museo Nacional de Antiqua, Lisbon. 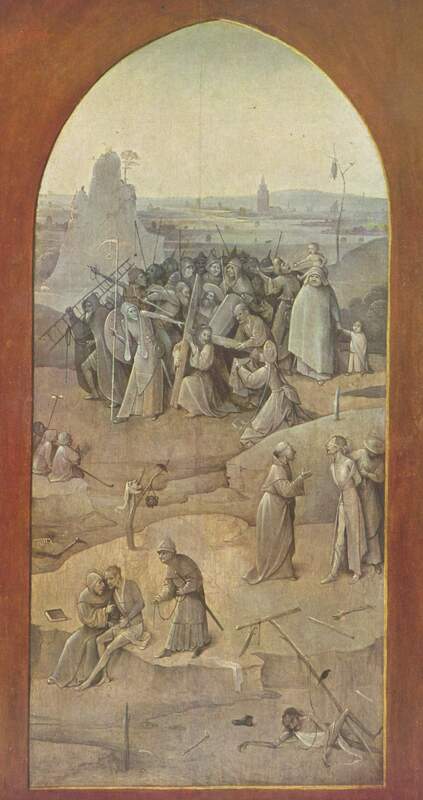 The Temptation of Saint Anthony deserves its own post (or its own book), but suffice to say it is a truly deeply strange rendering of the beings who accosted the saint after he went to the desert to pray, fast, and repent as a hermit. It is a scatalogical hellscape filled with pig-priests, ambulatory jugs, stomach monsters, and flying fish crane ships. Describing the actual painting exceeds my not-inconsiderable descriptive prowess: you will have to go look at it yourself. However the work was created in such a fashion that the left and right panel can close in front of the central panel (probably so that the painting’s original owners did not have their brains fried by the twisted nightmares swirling around the saint). When the actual painting was “shut” the two paintings above became visible. In stark monocolor, the paintings portray the sufferings of Christ as he moved towards his crucifixion. 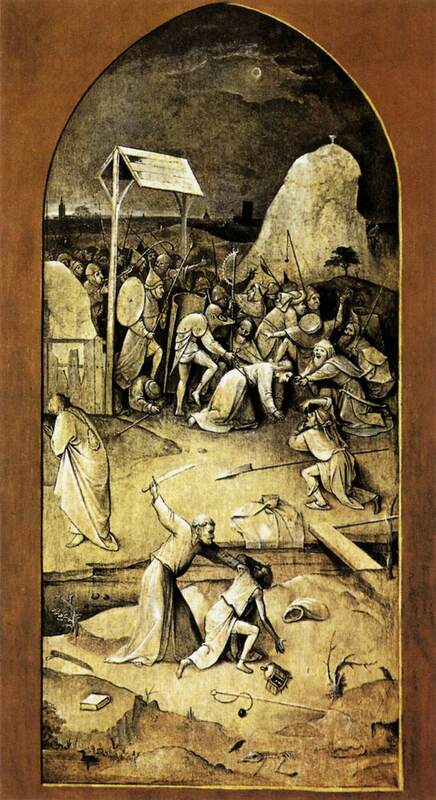 Great bestial crowds torture and mock the savior as he crawls on his knees (in the left panel) or is crushed by the weight of his cross (in the right panel), yet it is the torments of the human figures in the foreground which draws our eyes. In the right image a grim black storm fills the sky above Golgotha. In the left, the Flemish landscape recedes into a blinding gray erasure. Perhaps the most disturbing element of these paintings is the ordinary everyday 15th century Netherlandish garb worn by the people around Christ—and the everyday nature of Christ’s tormentors themselves. Are there children among the tormenting throngs? Of course these magnificent paintings are not really important compared to the true paintings inside the altarpiece. The one time I saw The Temptation of Saint Anthony, the work was open and the grisaille paintings were turned to the wall—barely visible in the shadows. Grisaille = early version of hip Instagram tools. Jump to the “standard” grayscale conversion operation. That is very weird. The style and content both look like some kind of 1960s/1970s surrealist artist’s work after tripping really heavily.